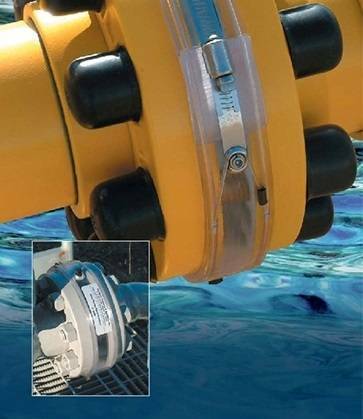 Kleerband Flange Protectors offer clear benefits compared to traditional corrosion protection devices such as shrink sleeves, tapes and wax fillers. For example, they are simple to install with a worm-gear connection, with no mess or special tools. They feature a positive loading relief valve vent and plug which ensures complete loading of flange cavities, whilst a transparent and flexible polyband allows for 360° uninterrupted inspection, without the need to remove the protector. Kleerband protectors are designed to fit all DIN and ANSI flanges from 0.5-inch diameter up to 144 inches and are also available for non-standard sizes and Christmas-Tree applications off shore. In addition to being used on oil and gas installations they are also ideal for protecting flange faces, studs, gaskets and ring joints on pipelines in chemical plants, refineries, oil fields, metering stations, water and waste water plants, pump stations and underground.